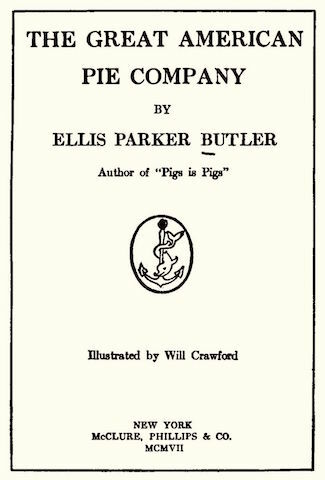 Ellis Parker Butler made his name as an author with the publication of "Pigs Is Pigs"
He published The Great American Pie Company in 1904. The story was set in Cedar Rapids, Iowa and has the distinct folksy charm of that midwestern state. It was made into a Hollywood film in 1935. The illustrations are by Will Crawford. Return to the Ellis Parker Butler library.